We believe that Silver is in its fourth intermediate term bull market correction and we would like to see how it measures up to the other three. 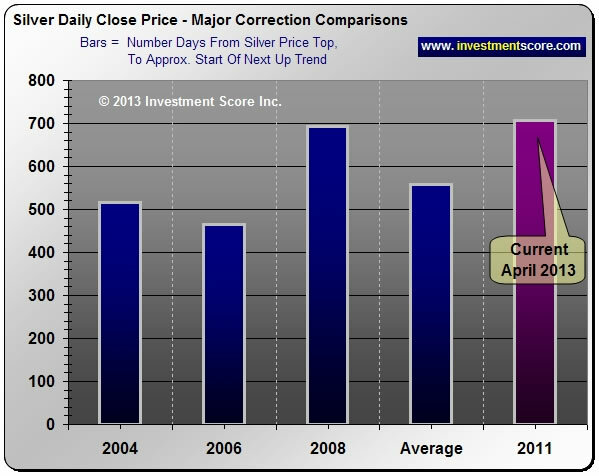 The above chart helps us compare the percentage drop from the top of each correction to their lows. This is remarkably helpful as it gives us a general idea of what may be considered “normal” for a silver bull market pullback. As we know, in 2008 the extreme circumstances of the Credit Crunch really helped push down all markets. The lack of credit to consumers, investors and institutions caused the volatile silver market to fall an impressive 55% from peak to trough. Amazingly this massive correction did not end this impressive bull market up trend. If a 55% correction is not the “maximum” percentage drop that we should expect from a bull market correction, it should be somewhere close. This 55% Aggressive and 41% Average percentage correction for this bull market is a helpful guideline to compare our current low of 46% to. But how long do these bull market corrections typically last? 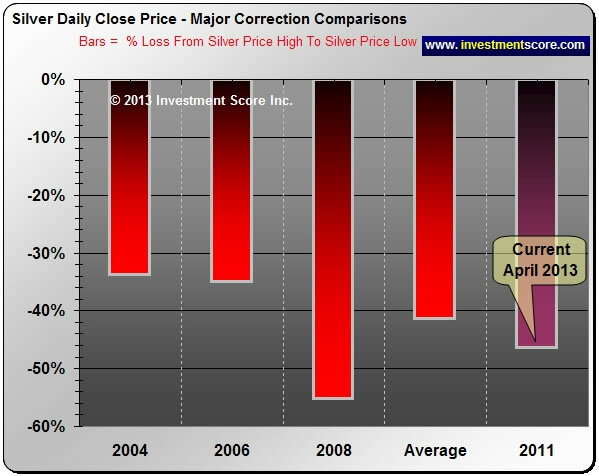 In the above chart we can see how many days the current correction in the price of silver has lasted compared to past intermediate term pullbacks. The point at which a correction ends can be a little subjective as one may be inclined to pick the extreme low of the correction or when a new high is reached etc. For our analysis we picked the best buying opportunity just prior to the following uptrend. We can see above that the current correction is getting a little “long in the tooth” compared to other intermediate term pullbacks in the current bull market. In terms of depth and duration it appears that the current intermediate term correction is closer to an end than a start. Note that we said “closer” and not “at”. These types of comparisons are only guidelines and assume that the bull market itself is not over. Of course the price of silver can correct further, it can last longer and it may never go back up. However, our proprietary long term charts and other indicators lead us to believe the long term bull market is well in tact and we find these kinds of charts both helpful and bullish.